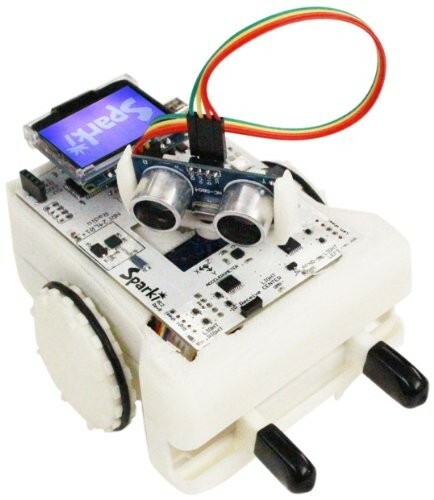 Sparki is an affordable, easy to use, and fun intro to programming, electronics, and robotics. It is geared towards kids elementary-age and above, educators looking for an easy intro to robotics, parents eager to find something affordable but educational and fun, DIY enthusiasts, and more. It is simple enough for beginners, while being feature-packed enough to be a must-have for pro-users. Sparki is your chance to have your very own robot, completely open source and available to do your bidding! Here are some of the things you'll learn how to do: edge avoidance; line following; maze solving; wall avoidance; room navigation; object retrieval; follow or hide from light sources; and shape drawing. Sparki's programming comes available in both Arduino code (C/C++) and drag-and-drop programming, all open-source.